The Center for Science in the Public Interest sent out a press release yesterday to announce a lawsuit filed on behalf of the nonprofit Praxis Project. The complaint says Coca-Cola and its trade association, the American Beverage Association (ABA), mislead the public when they trash the science linking sugary drinks to obesity, type 2 diabetes, and the like. It cites the August 2015 account in the New York Times of Coca-Cola’s funding of the Global Energy Balance Network, which aimed to shift attention from poor diets as a cause of obesity to lack of physical exercise. Coca-Cola spent $120 million on research from 2010 to 2015 that could cast doubt on evidence linking health risks to sugary drinks. Coca-Cola’s senior vice president, Katie Bayne, claims that “[t]here is no scientific evidence that connects sugary beverages to obesity. One of the scientists funded by Coca-Cola, Dr. Steven Blair, stated that “there is really virtually no compelling evidence” that sugar drinks are linked to the obesity epidemic. It will be interesting to see how this lawsuit fares. Stay tuned. I’ve been following the story of Hillary Clinton’s Wikileaked e-mails (which John Podesta says the Russians released to sway the election) but never dreamed that I would turn up in them. But Crossfit’s Russ Greene sent me his blog post yesterday and there I am [the photo comes from an article in the Sydney Morning Herald]. Strangely, the DC Leaks database does not include any Coca-Cola emails from August 2015, the month that the New York Times first exposed the Global Energy Balance Network. Nonetheless, it does reveal that Coke sent a representative to attend and take notes on Dr. Marion Nestle’s speech at Sydney University in January. Dr. Nestle, an NYU professor who most recently published “Soda Politics,” spoke on conflicts of interest in health science and government food policy. She mentioned the GEBN as a case study in soda-influenced science. Of course the pick up was limited. This was a private, invitation-only meeting with Sydney nutritionists deliberately kept small so as not to compete with my subsequent public lectures (see below for the media list). Who was the Coca-Cola note taker? I have no idea but the notes seem fine. I also turn up in the e-mails related to Center for Science in the Public Interest (CSPI). Evidently, Coca-Cola was tracking the social media response to a CSPI report on its marketing to children. 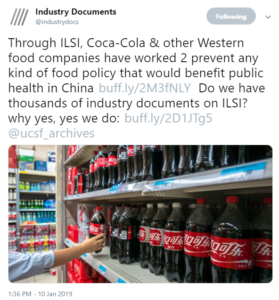 The most shared tweet was this one – https://twitter.com/CSPI/status/732239510138949633, which was mainly because Marion Nestle re-tweeted it. By now I assume that someone from Coca-Cola is taking notes at every talk I give and reporting in to headquarters. What does all this have to do with Hillary Clinton’s campaign? As Russ Greene explains, the emails reveal that Capricia Marshall, who is working on the Clinton campaign, is also working for Coca-Cola’s communications team. The evidence that Marshall is working on Hillary Clinton’s presidential campaign is extensive and undeniable. HillaryClinton.com features her prominently at Clinton campaign events. Last summer, Brian Wansink, a friend and Cornell colleague and the editor of the new Journal of the Association for Consumer Research, asked me to write a commentary on a paper to be published in its inaugural issue. The paper turned out to be by a group of authors, among them John Peters and Jim Hill, both members of the ill-fated Global Energy Balance Network, the subject of an investigation by the New York Times last August. Titled “Using Healthy Defaults in Walt Disney World Restaurants to Improve Nutritional Choices,” the paper described the benefits of improving the composition of kids’ meals at Disney World. The healthy defaults reduced calories (21.4%), fat (43.9%) and sodium (43.4%) for kid’s meal sides and beverages sold in the park. These results suggest that healthy defaults can effectively shift food and beverage selection patterns toward healthier options. I thought Disney’s sponsorship of this research and its withholding of critical baseline and sales data on kids’ meals that the company considered proprietary did indeed deserve comment, and wrote my piece accordingly. Brian Wansink soon accepted it for publication but to my surprise, gave it to Peters et al. for rebuttal. They filed a lengthy response. I was then given the opportunity to respond, and did so, briefly. The paper by Peters, et al. did was published in the journal’s first issue. This issue also includes several commentaries on other papers (none of which are accompanied by rebuttals). My commentary—and the back-and-forth—however, were omitted. After some discussion, the journal published my commentary online. You have to scroll down to find it. The site provides no links to it in the table of contents or in the article by Peters et al. Is it possible that Disney or the authors’ contractual relationships with Disney could have had anything to do with the omission of my accepted-for-publication commentary? Brian Wansink says no, they just ran out of room (despite room for others). In 2006, the Walt Disney Company announced a new initiative to improve the nutritional quality of meals served to children at its theme parks. The company would be changing the default kids’ meals—the components that come without having to be ordered separately–to include low-fat milk, juice, or water rather than soft drinks, and sides such as apple sauce or carrots rather than French fries. Parents who wanted sodas or fries for their children would have to ask for them, something many might not bother to do. Health groups had long advocated for this policy change (Wootan 2012). As I commented to a reporter at the time, “going to Disney World is an excuse for eating junk food…Disney or its advisers must be feeling they have some responsibility” (Horovitz and Petrecca 2006). Indeed, the healthier defaults were part of a larger effort by Disney to deal with its contribution to obesity in America. After ticket prices, food is the second greatest source of revenue at Disney World. Although reducing the amount of food consumed at the parks might help create a less “obesogenic” food environment, revenues might fall. But the default change might be revenue neutral. By 2008, Disney could report that two-thirds of U.S. customers ordering kids’ meals had accepted the default, with no loss in sales. In Hong Kong Disney parks, nearly all customers accepted the default. The report, however, did not include data on the numbers or proportions of customers ordering kids’ meals (Walt Disney Company 2008). Disney’s more recent summary of its child health initiatives states that it is funding investigators at the University of Colorado to conduct a more formal evaluation of use of the default options (Walt Disney Company 2015). The paper by Peters et al. (2016) in this issue of the Journal presents the results of that research. Their work confirms the ongoing effectiveness of the strategy. Nearly half the customers ordering kids’ meals accepted the healthy default side dishes and two-thirds accepted the healthier beverages. These choices resulted in significant reductions in the calories, fat, and sodium in purchased kids’ meals, but not sugar (Peters et al 2016). The authors argue that gentle nudges changes like these are preferable to more coercive policies that smack of nanny statism. Such reductions help, but are they enough to make a real difference? To answer this question, it would help to know what else the children were eating along with the drink and side dishes. Although the authors were given raw sales data, Disney did not permit them to use this information as part of the overall analysis. The company also refused to provide information about the number of children who visited the park or the number of kids’ meals sold. Nudges like this default are an important part of strategies to counter childhood obesity. But are they enough to deal with the public health problem? To make a real difference, they need to be accompanied and supported by a range of policy approaches. Current thinking about such approaches recommends combining insights from behavioral research, economics, and public health to establish a food environment far more conducive to making the healthy choice not only easy choice, but also the preferred choice. Doing so is likely to require multiple actions—for example, regulation of nutrient content and marketing; incentives such as subsidies of healthier foods; disincentives such as taxes, warning labels, and nutritional rating systems for unhealthier foods; and education of adults and children (Hawkes et al 2015). Disney’s voluntary default is a small step in the direction of such policies, but many more are needed if we are to make real progress in reducing the prevalence of childhood obesity. Margo G. Wootan. Children’s meals in restaurants: families need more help to make healthy choices. Childhood Obesity 2012;8(1):31-33. Bruce Horovitz and Laura Petrecca. Disney to make food healthier for kids. USA Today, October 17, 2006. Walt Disney Company. Walt Disney Company—2008 Corporate Responsibility Report. 2008. Walt Disney Company. Magic of Healthy Living brochure. 2015. https://thewaltdisneycompany.com/sites/default/files/MOHL_Brochure.pdf. John C. Peters, Jimikaye Beck, Jan Lande, Zhaoxing Pan, Michelle Cardel, Keith Ayoob, and James Hill. Using healthy defaults in Walt Disney World restaurants to improve nutritional choices. J Assoc Consumer Res., 2016;1:1. Don A. Moore, Daylian M. Cain, George Loewenstein, and Max H. Bazerman, editors. Conflicts of Interest: Challenges and Solutions in Business, Law, Medicine, and Public Policy. Cambridge University Press, 2005. Corinna Hawkes, Trenton G Smith, Jo Jewell, Jane Wardle, Ross A Hammond, Sharon Friel, Anne Marie Thow, Juliana Kain. Smart food policies for obesity prevention. The Lancet 2015;385:2410–2421. And here’s my response to the rebuttal by Peters et al.